Office 365 subscription plans that come with Exchange Online mailboxes, such as Office 365 Business Essentials, Business Premium, Education, Enterprise E1, Enterprise E3, Enterprise E5, Enterprise K1, and standalone Exchange plans such as Exchange Server 2013, Exchange Server 2016, Exchange Online Plan 1, Exchange Online Plan 2 and Exchange Online Kiosk, have been very generous with the mailbox storage space limits given to the users. Office 365’s Exchange Online plans provides 50 GB to 100 GB to every users, though cheapest plan only has 2 GB available. On-premise Exchange Server mailboxes start from 2 GB in size by default, but can go up to unlimited. For all mailboxes, administrators can change the mailbox sizes per user or globally. 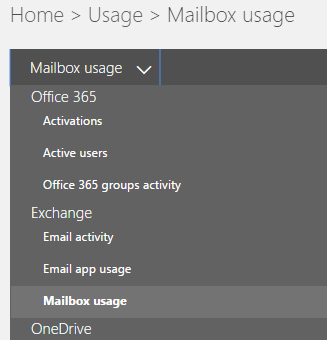 The mailbox storage limit for all Office 365 or Exchange plans can be found on TechNet. Thus, there may be a need to check the usage size of Office 365 and Exchange mailboxes. Especially now that the attachment size that one can attach to email can be as big as 150 MB, the mailbox can fill up quickly. This tutorial shows you how to check the mailbox usage of individual user, or all users at once from Exchange Admin Center GUI without using any PowerShell commands. 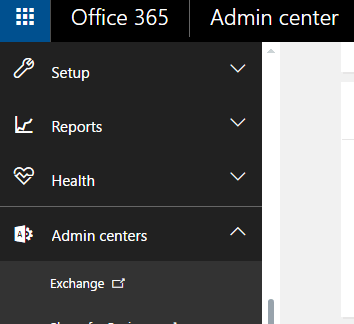 Expand Admin centers at the bottom of left navigation menu, and select Exchange. 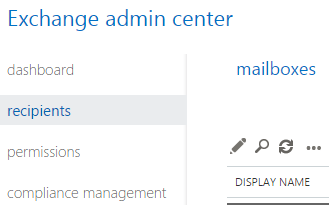 In Exchange admin center, go to recipients -> mailboxes tab. Select and highlight the user whose mailbox size you want to check. Click or tap on the Edit (pencil) icon. Go to mailbox usage to view the mailbox usage statistics of the user. If you need to check the mailbox usage for many users at one go, the steps above which show mailbox usage size of one user is not practical. The following tutorial shows you how to generate the mailbox usage report, which provides information about users with a user mailbox and the level of activity by each based on the email send and read activity. It also provides information about how much storage has been consumed by each user mailbox, and how many of them are approaching storage quotas. Expand Reports in the left navigation menu, and select Usage. Click or tap on Select a report and select Mailbox usage from the drop down list. The storage used by each and every user accounts (in MB) are listed below the chart.